I love small and/or skinny places. Not just aesthetically, but their very nature leads one to imagine that perhaps this place has been missed by others and is off the beaten path. Or perhaps the place is unusual in other ways - after all, a mainstream business would not typically rent a space only seven feet wide. And the architectural history of tiny or narrow buildings is always fascinating, like 75 1/2 Bedford St. in the West Village which is only 9 1/2 feet wide, considered the narrowest house in NYC and occupied in the 1920s by Edna St Vincent Millay. There is a remarkable, very unique tiny triangular building that houses the restaurant Bite - see it here. And I love the beautiful tiny building that houses Vilebrequin - see my previous article on it here. 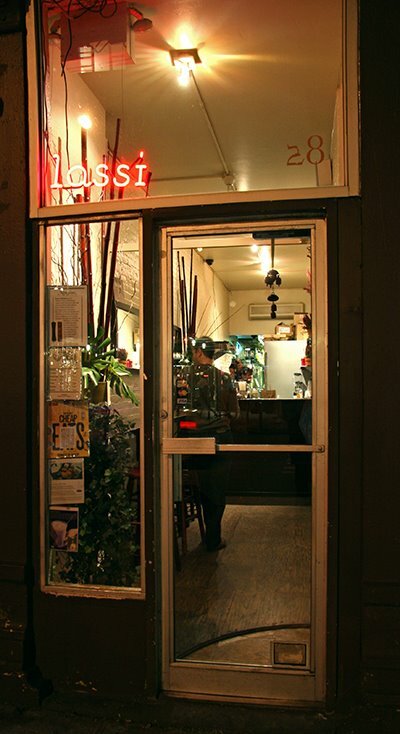 Lassi is an Indian restaurant at 28 Greenwich Avenue. This tiny, narrow space is where Heather Carlucci-Rodriguez plies her craft. She was a former pastry chef at L'Impero, Veritas and Judson Grill, each receiving 3 stars from The New York Times, as well as working for a consultant for France’s Michel Cluizel Chocolat and Domori Chocolate in Bologna, Italy. she has a culinary education from the Restaurant School in Philadelphia and also in France. An unusual pedigree for a restaurant specializing in northern Indian cuisine. Related Postings: Bite, Vilequebrin, 121 Charles, Bomb Factory.